Throughout 2014, content marketing was a principal player in many organizations. Many experts, leaders, CEO’s, CMO’s, etc., said that the results they obtained from this were very effective, and they will also be relevant for years to come. These results are shown in the next infographic of Wheelhouse Advisor: 10 Marketing Predictions for 2015. It is also very interesting to see how many marketing agencies show that mobile will play an important role as well. According to an eMarketer article, Mobile Search Market Too Big for Test-and-Learn, It is predicted that nearly 130 million US consumers will search via mobile phones using apps in the next four years. The growing population of mobile searchers, coupled with changes made to algorithms and advertising platforms, have forced marketers to include mobile-specific tactics in their search engine optimization (SEO) and search engine marketing (SEM) strategies. But marketers need to brace themselves for another wave of change: Consumers are increasingly conducting vertical searches in category-specific apps, not mobile search engines. Troughout the years, the predictions have always been very important in business, but have numbers. As my former boss at Merck always said : Numbers are Numbers. However, he always told me : Juan Carlos : Opinion leaders are a very important key in any business that you want to start, and he was right. He was a very influential person to me, and of course I have to mention his name : Oscar Ferenczi. I have always been believer that the biggest factor in our professional development is the knowledge that we learn from experts in various fields, and that predictions are always very important and will continue to be important. All of this being said, I decided write this article titled “Visionaries : The 2015 Marketing Predictions”, in which visionaries, leaders, thinkers and experts in marketing world share their predictions for 2015. I wanted to do this differently. Rather than write and write, I had an idea. I should ask them what they think about the predictions for 2015, and as expected, they are now sharing with us their thoughts. The following quotes are from professionals in my network whom have had a great influence on myself and others in this professions including social business, social media marketing, digital marketing, coaching, etc. I wanted say thank you to our wonderful participants who took the time to share their experience with all of us. I personally learn a lot from you guys. Gracias. Is Google Plus The New Super Hero for Marketers?? Teamwork always brings good results, right? Natascha Thomson and I, we were working on the second part of our series of blog to try understand the value of Google Plus for marketers and we asked our peers to share their personal opinions on the network . Why are you on G+? G+ vs. FB: Your thoughts? How do you measure G+ “success”? Any other insights to share? This blog is part two in a series. In the first blog, The Truth about Google Plus, started to look into the viability of G+ for marketers, sifting through research reports. This blog presents the results of an informal survey we conducted within our personal networks of G+ users, asking them to share their experiences and opinions. Probably the biggest epiphany I’ve had about GPlus is that there’s an influencer type that nobody ever thinks about, yet is the largest population of all: the decision maker’s influencer (I.e. You, I and our contacts – not the big guys). When I’m in GPlus or LinkedIn, I’ll take engagement with a regular Joe influencer over even a decision-maker any day. These are the people who will be your champion. My measure of success here is in the quality of conversations. I’m on G+ because I find it very engaging. I’ve yet to +mention someone and not have them acknowledge me in some way. The influencers are warm, welcoming and encouraging. Plussers want to help you as much as they are able to. “Facebook reminds me of high school. It’s fun, silly, and you don’t really learn anything that benefits you in the real world. …on Google Plus based on the level of engagement I do. The connections I make and how much I am learning. I feel G+ is going very good for me and it has become my favourite social media platform by far. HOA’s are my favourite feature! I love being able to interact with people in real-time. Plus it’s wonderful to see/hear a person talk as opposed to reading what they write. For anyone who is new to Google Plus, my best advice is to remember that you’ll get out of it what you put in. It’s a social platform and users want to engage with other users. Don’t be shy! I started on Google Plus because I was interested in Google Authorship. I’ve learned that there’s a whole lot more to it than that. After accidentally deleting my Google Plus Profile last March, I’ve become an even bigger fan. IMO Google Plus is the best network for curating interesting information and useful content from an incredibly wide variety of sources. I’m also here for the networking – I’ve met some really great people and my connections have led to real business opportunities. And of course there’s also the potential for increased visibility in personalized search results for people I’m connected with. I find Facebook to be very oriented toward personal sharing. When I’m on Facebook I’m not thinking about business, which is why I think it can work for B2C but I’m not convinced of it’s value for B2B marketing. HOA’s. I love adding ones that are about a topic I’m interested in to my calendar and going back to watch it later. I do like the hangouts for one on one conversations. I also feel like it’s the place in which I find the most content that I can learn from. Also engagement is one measure, but another measure is that I can attribute actual business opportunities to my activity on the platform. Some have been very direct such as a referral from someone in my network and others have been indirect, but I can trace the lead back to something that had to do with Google Plus. LinkedIn and Google Plus have two very different cultures. For me, LinkedIn is the professional breakfast meeting, a place where personal updates are rarely if ever shared and the conversation centers only on business. Google Plus on the other hand is the company picnic, a gathering where people are still on their best behavior but they introduce you to their kids and chat about hobbies and interests outside of work. If you use both platforms well, prospective clients or recruiters have the opportunity to see the authentic and well-rounded you and that might help you seal the deal. I came to G+ for the authorship and found nothing to like. When I returned with a determination to get to understand it better, I started to really enjoy it. That was mainly down to +Mark Vang inviting me to his community where I have learnt so much. I now love it! I use FB only to keep up with family, and to connect with clients who follow my page. I have a small following there but they seem pretty engaged when I do post, which is infrequent. …but actually, I measure it by the connections I have made, the fact that I care about finding out what is going on with them, and that I feel I have a good grasp of how to use the platform, and I mean use, rather than leverage. From a business perspective I should probably try harder! ...the knowledge contained within the collective minds on the platform. I have picked up so many tips and ideas along the way, that really make a difference to my business. Some have come through HOA’s and some through posts or comments, so that is why the feature is knowledge rather than any particular facility. Just to see what I may have missed. Less salesy, easier to follow, to be honest. I really like the content that +Susan Scrupski posts on G+ too. How do you measure G+ “success”? How is it going for you? Not sure; I don’t get that many “plusses” and since +Steve Rumsby and I had an exchange about posting the same content on multiple platforms I don’t contribute that much here. I like the Google Hangout (is that a G+ feature)? The way it sends “Birthday Wishes” – far better than FB. Not sure why it is not taking off. I am not sure how to set up Circles. I’m not sure I even want G+ to be successful for marketing – I’m happy with all of that going to FB ;). G+ is my favorite non-business network (I think of LinkedIn as a business network). I haven’t found any success on G+ either personally or professionally other than its SEO benefit. I do feel that Hangouts-on-Air are a big success but they are separate from G+ as a social interaction network in my mind. Hangouts-on-Air is my favorite feature. I think Google has had a number of stumbles with G+ and even thought it is one of the top social networks it doesn’t seem to have found its place yet. …it’s easy to access from my other Google services and GMail. I see FB as good for B2C and for personal uses given its privacy and features. Though I don’t use FB that often to connect with friends anyway. I don’t use G+ at all to connect with friends about my personal life. It’s more of a business tool for me. I have a hard time measuring G+ right now (I’m working on tools to help with that). “Success” metrics for me would be growth in terms of people following me (or my pages), engagement (comments and +1’s), and any leads or relationships established due to G+. Website metrics tie right into G+ if you’re using Google Analytics and that really helps track success as well. Ultimately driving traffic is a big part of success on the internet. My favorite features for G+ include business pages and hangouts. I don’t know, I think G+ is still trying to find its niche to be frank. It’s another channel that I do try to use, but right now I’m more focused on Twitter. Why are you on G +? I started using Google+ in 2012, just to see what this new network offered and I’ve been a little bit saturated with other networks. On Google+, there is a good balance between people who have the same interests in regards to professional topics. The main difference is segmentation. G+ has the circles, which let you easily share targeted content with a specific audience. I measure success as a high percentage of engagement with my posts, and “follower” growth. Google+ is now my second favorite social network, right after Twitter. Twitter refers the most traffic to my blog. What are your favorite features related to G +? (eg communities, HOA …). The best feature on G + is the integration of all Google services. G+ communities, because they provide one of the best ways to meet new people who share your interests, and as blogger, it helps me to improve my SEO. I opened my account in Google+ in 2011, I was invited because I worked in a business incubator , but it was not until 2013 when I started to use this network as a strategy. Due to the UX it can be used like LinkedIn for business topics. I’d add that is a social network that has a mix between leisure and professional publications. The main difference, at least in Spain, is that Facebook users log in with an intention to just have fun; more than on Google+. There is also a greater range of segmentation and freedom of interaction between users. For professionals, it also offers something similar to LinkedIn groups via the communities. I think that having success on Google+ has a lot to do with getting followers regardless of whether you follow them or not. Just because they like what you are posting. More and more people have been following my blog because they have read my posts on G+. If I had to rank: Twitter is my favorite network, and Google Plus comes second. Google+ is interesting for a variety of services available via Hangouts, their email services and the functionally on mobile devices. Even though similar to LinkedIn groups, G+ functionally works much better on mobile. I also like the ability to host webinars and classes on HOA. G+ is valuable to drive traffic to your website, blog, or both. The influence of G+ on SEO should not be neglected. Make sure you have a well-defined and distinct strategy for G +. Don’t forget that each social network requires tailored communications to be most effective. Initially, because I felt obliged to be, i.e. use Google to stay current but now mainly to ‘take a break’ and learn via HOAs and Communities. I struggle with how best to manage Facebook so tend to stick to people I know offline ‘though that gets tested when someone I know online only sends a friend request. G+ is my slightly more acceptable public face! No measurement for me and that probably sums up my approach to social media generally. Probably wrongly! The right communities, e.g. like Sanctuary; good mix of people, knowledge share and well-managed. I’m slightly concerned that G+ is turning into one big community of social media experts and everyone else is oblivious to its potential! If you liked this post, visit MarketingXLerator too for more insights, and feel free to comment here if you want ! I had the great opportunity to attend the inbound 14 here in Boston organized by HubSpot. This is a short post in which I am sharing the best templates ( my opinion ) from some of the experts during their keynotes . David Meerman Scott is a well-known social media marketing speaker and leader, I can say that he inspiring me on my social media and inbound marketing work. Guy Kawasaki is the chief evangelist of Canva, and used to work at Apple , he had a Keynote during the open of the #Inbound14 : “10 Marketing Lessons from Steve Jobs”, to me a very good template was this, the number 8 : Value ≠ Price and I think apply to all kind of the professionals fields. Chris Brogan is CEO of Owner Media Group, Inc , Brogan provides education and tools to help you make your life and your business thrive. Is a compilation from from my view, I hope will be inspiring for you too! Is Google Plus a Great Place to Engage ? It started with an email exchange and ended in extensive research, interviews and, finally, this blog on the viability of Google Plus for B2B marketers. While there is much written about Google Plus being one of the biggest and most active networks, for some reason, we did not seem to see this in our own networks. Natascha and I are also both on Facebook, where he have been building our network for a longer time, and maybe – for that reason – we have not been as dedicated on G+ as we needed to be to see more return. I asked Natascha: “Where on G+ is all this supposed activity happening. I don’t see it in my newsfeed”. Her response: “I think where it’s happening is in the communities, and via Google Hangouts.” But, she added: “That’s just my personal experience, we’d need to dig deeper”. As we did for our popular series about the use of social media around the globe, we started to reach out to our networks to gather some facts. Analysis of data obtained from sources including: Jeff Bullas, Janrain, eMarketer, Marketing Xlerator . Interviews with people in our network who are active on social media. This is a random and small group and, hence, not statistically significant. While the Google CEO Larry Page said in his own post on the company’s social network that: “We’ll continue working hard to build great new experiences for the ever increasing number of Google+ fans”, we dug deeper to see what this really means. The graphic illustrates how in the first quarter of 2014, Google Plus increased as a choice for social login, not too far behind the number one, Facebook. Google Plus might not be gaining social media activity but it is technically gaining users because its login is the same for Google’s entire ecosystem of products. Google tried to integrate Gmail with its user base on Google Plus, the company will scrap that mandatory integration with its other products. 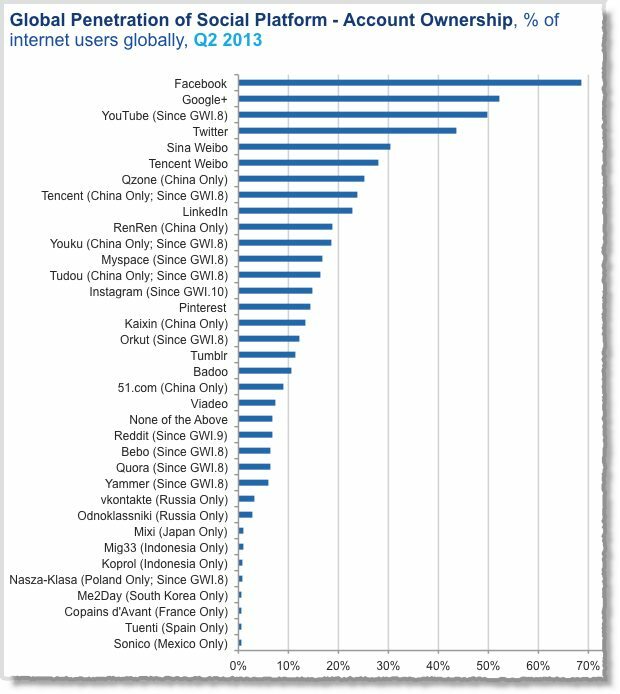 Facebook still dominates at 70% of account ownership. Google+ is not far behind at just over 50%. Note: a Google+ account is mandatory whenever you create a new Gmail account, pushing up the account ownership stats. Social media is not just for millennials but all age groups. According to the graphic below, a high % of G+ users are part of Generation X. 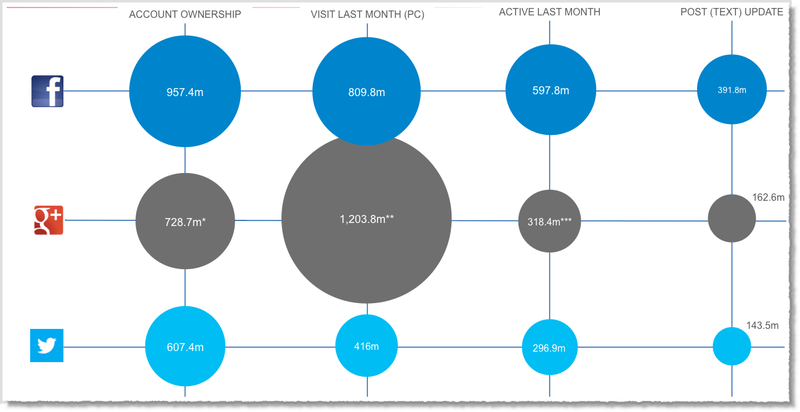 That monthly visits on G+ have risen above 1 million visits per month. The ugly truth is that this activity is (at least partially generated) by visits to other Google services than to G+ (e.g. Gmail) that are counted as a Google+ visits. Facebook users post more updates and are generally more active than G+ users; even considering the fact that Facebook has more users than G+ overall. Twitter has a much smaller foot print than G+ in terms of accounts and monthly visits, but comes astoundingly close in terms of activity and post updates when compared to G+; even within the 140 character limit. You do the math. Mobile devices like cell phones and tablets have accelerated the social sign-on trend; particularly for apps. Google Plus position ( 25 % ) is not bad, but not great, and it looks like the recent policy change allowing “fake names” on Google+ might give the search giant the social login boost — attracting those who are not into divulging their real names online. Social sign-ons are great news for marketers, as the convenience they offer can increase registrations and other (potential) buyer engagement in marketing campaigns. The social sign-on information can then be used to match individuals with existing records in a CRM system to create more complete personas. As a result, marketing messages can become even more relevant in regards to product, place, promotion, and even price. Facebook still leads in terms of preferences engage, social login, shares, ages, etc. Google Plus is a very interesting and important network, however, still has much to gain in this battle . What if it is not mandatory to open a Gmail account to access Google Plus? What would be the real numbers ? If you have comments, please comment . We’d like to hear about your own experience with Google Plus. I am convinced that we have to cultivate relationships and in this digital age and social media we live in, networking plays a very important role in our day to day. Ted, is Social Marketing Strategist, Keynote Speaker, Brand Evangelist, Acting CMO Brand Innovator and Forbes Top Powers Influencers . 1. Is networking in social media a worthy investment ? Depends upon what you call worthy. Is building and extending relationships worthy? is having friends, fans, advocates who support you worthy? We have to move beyond simple sales and marketing and realize that relationships are the new currency and Return on Relationship™, will enhance all your personal and business efforts. Return on Relationship… simply put the value that is accrued by a person or brand due to nurturing a relationship. ROI is simple $’s and cents. #RonR is the value (both perceived and real) that will accrue over time through connection, loyalty, recommendations and sharing. Relationships are like muscle tissue… the more they are engaged, the stronger and more valuable they become. 2. What are the keys to good networking in today’s digital world ? Social has been called “networking on steroids” , but it only works if you do the “work” of “networking.” and community building. That requires a strategy and a time investment. Make deepening your LinkedIn relationships an activity you work on every day (or at least on a regular basis). Block the time out in your calendar and just do it. The same goes for Twitter, Facebook, Instagram—who cares how many followers or friends you’ve accumulated—how many real conversations have you instigated? How many people check your posts in some way every day? Whatever platforms you’re using, figure out the tools for expanding your network and put them to use. Make comments, ask questions, find common ground and invite further conversation. Connect with people on multiple platforms—put them in lists—listen to their conversations and add value where appropriate. Do the networking work, then take it a step further and build community. A network is just a series of nodes, but a “community” supports each other… creating value, strength and long lasting relationships. 3. I recently read an article of yours in American Express Open Forum, about networking which mentioned the phrase “Be a curator of people” . Could you talk about the meaning of this? We all know that real-life, face-to-face networking is a powerful tool for good, so expand it to your social channels and build community as well. Spend a little time actively looking for a few people you can connect, and make that introduction. You never know what fruit these referrals will bear down the road. Some will go nowhere while others will result in life-changing relationships, but I promise that the social karma you receive from these efforts will lead to a positive Return on Relationship. 4. Is there anything you would like to add about networking and social media ? Start looking at the connection/interaction not as win/win… but learn/learn. Win/Win is good, but implies an end. Once you win, then what? Learn/Learn creates a paradigm of ongoing value. This creates a Learn/Learn situation (I learn about you and you learn about me). Welcome to the ‘Age of Influence,’ where anyone can build an audience and effect change, advocate brands, build relationships and make a difference. It is all at your fingertips is you apply time, effort, and a true desire to build relationships. I want to thank Ted Rubin. It has been very inspiring for me as well as a great learning . I’m re-blogging this post, because I think always the manners matter. Like Chantal said : Thank someone who never gets expressions of gratitude….Respectful service entails an extra helping of help, an enduring act of benevolence and a sincere interest in making a difference in the welfare of those around you. I am excited to help celebrate the first anniversary of Chip R. Bell’s book The 9 ½ Principles of Innovative Service. It is a great book that will inspire you to create better service experiences in all you do. To read a sample chapter click here. The following is a guest post from Chip. The night before my annual physical examination I received a text from my physician reminding me that the morning exam would be started with a blood test. “Remember, no food after midnight and only water or black, unflavored coffee in the morning.” I am a big coffee fan! My post has two parts. Part one includes data and information found through my research. Part two focuses more on the personal experiences of my friends who are residents and social media entrepreneurs in Silicon Valley. Then, we can have a fuller vision and very close to reality . The city was initially known as “The Valley of Heart’s Delight”, but in 1971 was nick-named by journalist Don Hoefler, as we all know now: Silicon Valley ( SV ) . Important results about what are the top strengths of doings in SV ? The entrepreneurial spirit and forgiveness of the failure is a culture. Atari started with $ 250 and people thought that a completely crazy idea to play on the TV. 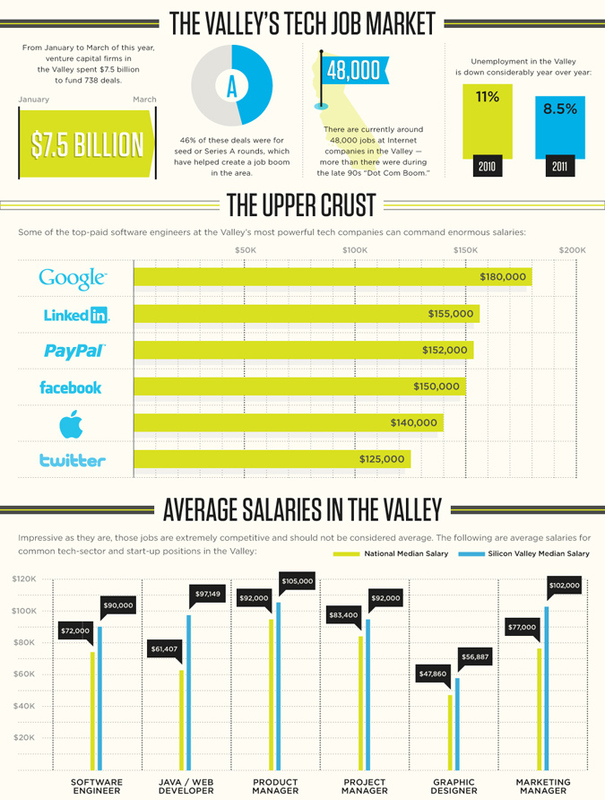 According with Fast Company in the following infographic : rates and salaries in SV are above average in all United States. Product and Marketing Manager’s have higher incomes. The race for talent in SV is Highly competitive. Companies like Facebook and Google and some Startups, offer incredible compesations packages that include access to stocks and other benefits. ( I’ve had the opportunity to work in that system at Merck & Co, is an excellent system ). Read Quote of Marc Bodnick’s answer to Is the Silicon Valley culture as “nice” as it appears? NYC startups tend to be focused more on the business whereas the Valley is focused more on the What If…? SV is the first city in U.S. in number of Startups, which shows us the entrepreneurial culture in this part of the world. San Francisco Bay have approximately 7.15 million of population. Stanford University and University of California Berkeley are here. Source and Templates : Slide Share,Wikipedia, Google, Quora, Brian Solis, Marketing Xlerator, Fast Company. *I did this research for myself, the data/info may vary.